This year, our actual Christmas Eve/Day celebration(s) will be about the least eventful I can recall. The hub's mom and grandma were to come down just this afternoon, and then we would head to 5 p.m. mass, for which J and the children's choir would be singing. But unfortunately the MIL came down with the flu or something, so here we are on Christmas Eve, with nothing much to do. My mom has been in TX visiting with my little brother and his family for almost four weeks now. She should be back this weekend, so we will celebrate, just after the fact. But it is just weird for me not to be around my family (besides my immediate family) during these few days. I had a great few days (I try to celebrate for two or three). It started on Thursday with my traditional birthday lunch at Mad Mex with a couple of friends/former coworkers. Mmm, shrimp-mushroom-spinach burrito. Friday included wearing of the birthday pin (for the 19th year) and a coworker-made hat (by the coworker who shares my birthday), lunch at Hems with coworkers, early work exit, dinner at Roman Bistro (best of the three meals) with family, Penguins and Pirates shirts as presents, and watching "Girl Meets World" with my kid to end the evening. 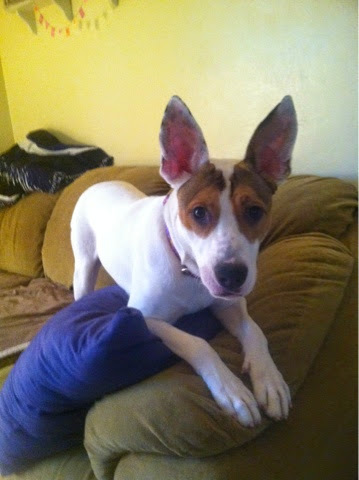 But the biggest part of my birthday weekend was our adopting a dog from the Humane Society! I decided a couple of days ago to do a "bright side of December" thing for Facebook. Last year, so many people did 30 days (or however many days there were until Thanksgiving) of thankfulness. No one I knew did that this year, and I realized I kind of missed it. So I figured I, who am often optimistic, would put my own spin on something. On Monday, I had to get my windshield replaced. This was the second time in five years (almost to the day), and in between I had some cracks/nicks replaced. Having to spend $100 (deductible) on something like that so close to Christmas does not make me happy. But the shop ended up doing it in only 20 minutes, and it cost $80 instead. So I decided to think of it as saving $20, not spending $80. Bright side! Oh, and I no longer have to look at the cracks in my windshield. As I get ready to head over a river (well, a man-made lake) and through some woods, I wish all of who still happen by these parts a happy thanksgiving. May your day be a good one, and may you not be alone, unless that is what you want. And most of all, I hope you can find at least one thing to be thankful for. I know I get down at times, frustrated by various things. But I am thankful that I can be thankful. Jagoffs are everywhere and perception is reality. Last night I watched, on live TV, some jagoffs smash the windows of several businesses in Ferguson. I saw even more people steal bottles of liquor. My suspicion is that most of those thugs don't care about Michael Brown or his family. Some of those same criminals would have probably at least vandalized businesses even if the grand jury reached a different conclusion. So thanks to those idiots (and I really want to use a stronger noun), people are painting the entire town and/or supporters of Brown with the same brush. And perhaps as unfortunate, their actions may discourage peaceful protesters. And most unfortunate, there will be those who say (and have already done so on social media) that the actions of those criminals somehow prove that Michael Brown was a thug and that his killing was justified and/or the officer who killed him did so with reason. I may hate furniture shopping even more than I hate going to Walmart! Our couch and leather recliner in the den are pretty much destroyed, thanks to Sadie, who never met a piece of furniture or carpet that she did not want to dig at. I never much cared for the couch anyway, and it is almost 13 year old, so we decided to replace both of them. The hubs had this brilliant idea of getting a sectional with a cup holder feature in between one of the love seats. I am not a fan of those, but I gave in, mostly because he had me sold on the chaise. Yesterday, while J and I were at my mom's, he went to a furniture store, found a set he liked, and emailed me a pic of it, which included a chaise. I liked it okay, so the three of us went to see it today. About 72.5 hours removed from saying good bye to my dog and I am getting through it. As I have said over and over, I did not think it would be that/this hard. But I did not have much to compare it to. Waking up Tuesday was pretty bad, just knowing I no longer had Sadie. It was so sad peering down the steps and not seeing her there, either waiting on the other side of the gate or sleeping beyond the gate in the living room. Of course the gate wasn't up either. And there was no dog to take out or feed, yet we still could not leave on time. I did not think it would hurt this much. Two months ago, I started a blog for/about our dog Sadie, just after we found out she had cancer. I was hopeful writing would be cathartic; I was particularly concerned how J would handle it and thought if nothing else, it would give her a chance to write happy things about our beloved dog. As with a lot of things, J started out enthusiastically, but in time, she did not have much to say. Plus school got in the way. But I managed to write a good bit and post some good pics. I hope to continue it for awhile. But just 23.5 hours removed from Sadie's death, I am still devastated. I never would have guessed it would have affected me this way. I am a big fan of performances. I particularly love musicals. 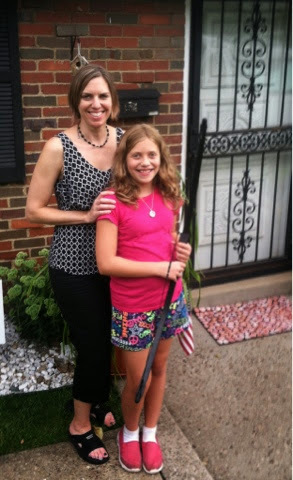 For many years I had a subscription to Pittsburgh Musical Theater (nee Gargaro), but then my husband opened a restaurant, I had to take a 25 percent pay cut, and I had a baby, all within a six-month period, so that ended that. About five years ago, we discovered Gemini Theater, a wonderful production company that puts on reasonably priced interactive performances geared towards children. We attend a few show every year, but J is kind of old for them. Earlier this year, PMT put on LeMiz. I had never seen it but knew a little about it. Some of it was adult-related, but the musical director (my former choir director) assured me those things would go over J's head, so I took her. He was right; the brothel scene was just a dance hall for all she knew. J enjoyed the performance, as did I, though she admitted parts were confusing. So I ran in my first 5k in two years this morning. 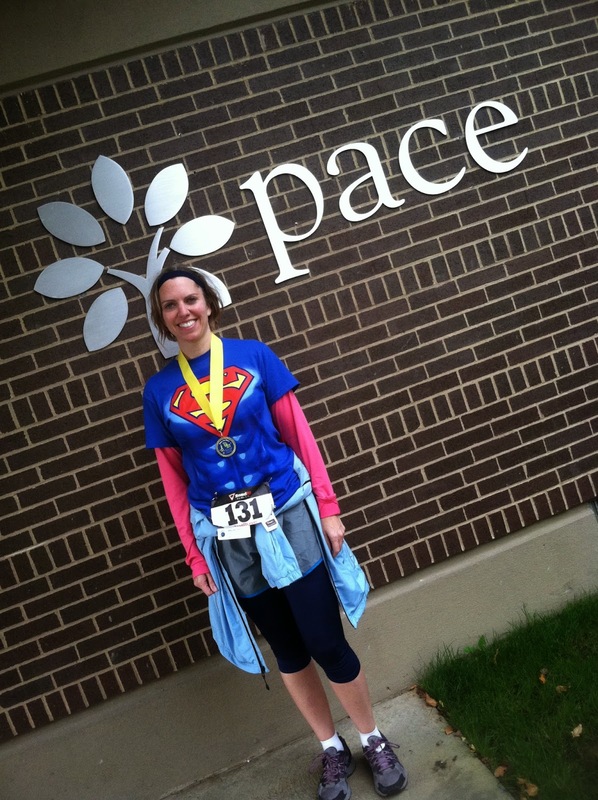 I ran in the Race for Pace, which is one of my favorites because it is local (10 minutes from where I live) and Pace School does great things for kids with emotional and behavioral disorders. I initially wanted to finish in under 35 minutes, but once I realized that I ran the race in 28:55 two years ago, I decided I had to do better than 35. Even though back then I ran, swam and did Zumba weekly, and I was two years younger, I refused to settle for something six minutes slower. For the love of FloJo, I am not that old and out of shape. So I set a new goal of 33 minutes, though I was really, really hoping to do it in 31 minutes. Ladies and gentlemen: This Supergirl finished in 29:21. And, best of all, I got first page in my age group, 40-44 (or 40 and Fabulous, as I like to call it). 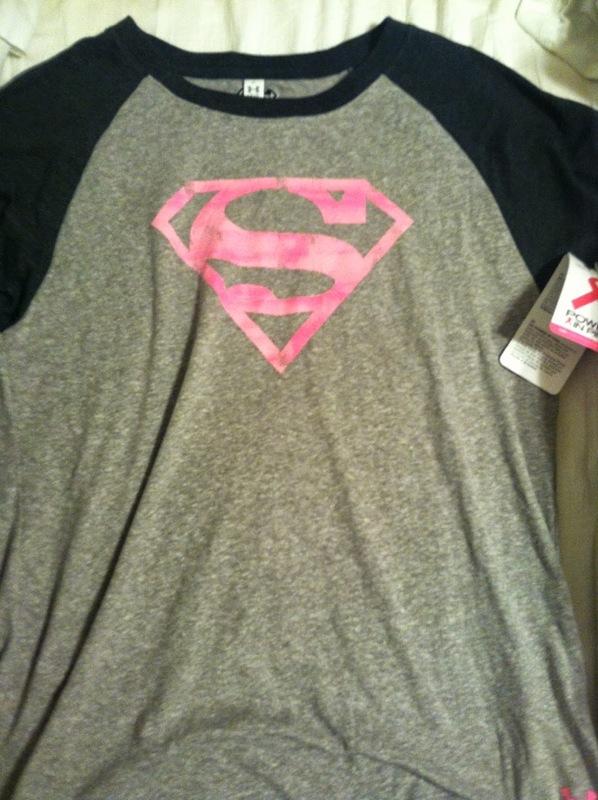 What kind of guy would wear a shirt like this? I started running again about five months ago, somewhat sporadically. But about two months ago, I decided that maybe, just maybe, I could run in a 5k again. So I figured I had better start running once a week, if I had any hope of running the entire thing. Once you are fully entrenched in your 40s, it is a little more difficult to just run a few times over the course of a couple of months and go out and do a 5k. Or so I would imagine. On Friday, I had planned to leave work a few hours early. Because the bus I ride runs every 30 minutes that time of day, some planning is involved. So after being too busy to make the 1:19 bus, I left at 1:44, which would give me 5 minutes to make the 1:49 bus. As I was about 2/3 of the way down the street, I saw two buses at the stop, across the street. I looked at my phone and saw it was 1:47. Since it was early, I told myself it was unlikely either bus was mine, so I decided not to run the rest of the way down the hill, knowing the light would change before I got there. Fortunately when I got to the bottom of the hill, I saw the buses, now a block away, were not mine. Less fortunately was it was raining harder than a sprinkle, and I had yet to replace my recently broken umbrella. Before I knew it, 10 minutes had gone by, as did five other buses, and I started to fret. Maybe my bus had come early. After all, the drizzle did not seem to be enough to justify a delay. I thought I would wait until the ire surrounding the Ray Rice/domestic violence in the NFL died down a bit before posting some thoughts. Of course, with an ongoing investigation, it is still rare to go more than a few days without seeing that incredibly disturbing video. Can someone please tell me I am not alone in feeling as if I were a different age on different days?! I am 42 3/4, and quite comfortable sharing my age with anyone. This is due mostly to my mom's shaving four years off her age and my finding out about it in the seventh grade, via looking at her yearbook at Grandma's. But the other reason I don't bother hiding my age is because if you are not getting older, then you aren't doing anything (except, perhaps decaying in the ground). You are welcome for that visual! But feeling and/or looking a certain age is another matter entirely. Pretty sure I've used that as a blog post title post before. But it fits. Yesterday, we found out Sadie, our nearly 13-year old dog, has cancer and likely only a few months to live. She had a growth by her tail, which hindered its usual question-mark shape. I had thought it had to do with her injured ACL (maybe she was overcompensating). But when I really looked at it, I decided maybe we should get it checked out. Let me start off by saying I have much to be thankful and grateful for. And I am mostly positive and optimistic, so that helps. Some days (mostly, fortunately, just hours or even shorter periods), I feel frustrated. Angry. Sad. Other things. I might yell. I most likely will cuss. Sometimes I even cry. I wonder how things got that way. Why this happened to me. When things will get better. I like things to make sense. I believe people should treat others as well as animals and nature with kindness and/or respect. To this day, I just don't understand why people do otherwise unless they have been badly provoked (for the record, I am pretty sure the empty McDonald's bag you just threw on the street did not provoke you, but I could be mistaken). I took a vacation day yesterday. Things have been slow at work, so I figured I might as well take the day (even though I will probably want/need that day this coming school year when J has about a dozen, somewhat random, days off). J and I were finishing up a visit to my mom's, which included my adorable, but somewhat whiny and very good storyteller, nephew. I did a little cleaning and laundry at home, nothing too exciting. Mostly I was just glad to be off on a Monday because who likes Mondays? Except by "losing" my Monday yesterday, I got punched in the gut by Monday's evil sister, appearing on a Tuesday. It started off as it had for the last week, which was with a slight pain in my back from something (cyst maybe?) that I will now most likely need to have removed. Try not to visualize that too much. Yesterday I took my dad and my kid up the incline so we could get a great view of the city. I ended up with some nice shots. I only wish I had thought to have brought my camera; the iphone does not do the view justice. We ate at the Grandview Saloon, which I have not been to, I am guessing, since before J was born. We were fortunate that the waiter got this nice shot of the three of us with the view in the background. 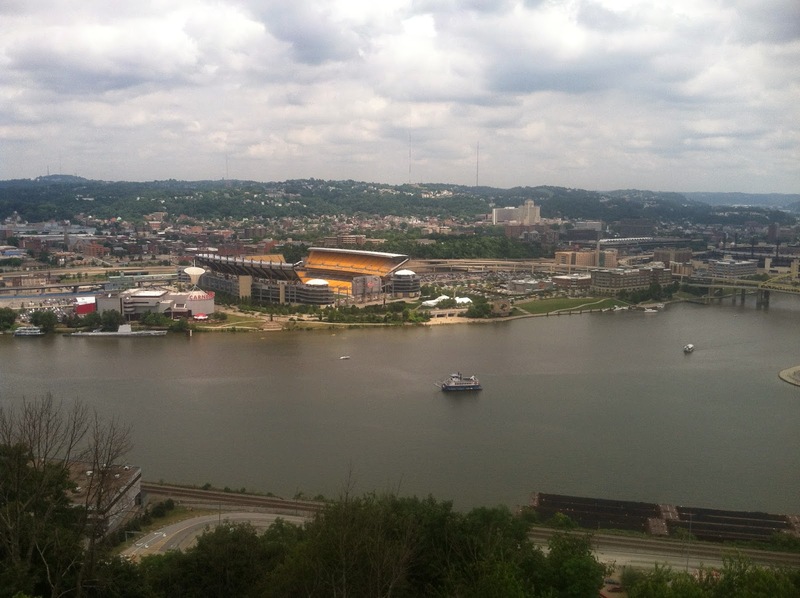 We also took a Gateway Clipper one-hour cruise, which allowed me to get a handful of nice city shots as well. We had a fabulous vacation in Ocean City, Maryland, last week. I highly recommend doing a mini-week there if you are within six hours away. Being at the beach for seven nights is a bit much for us; my skin could barely take the four days we were there. And by staying just over half a week, we saved money, obviously. But I do admit I would have loved one more day. Food was an integral part of our trip. I love to eat. 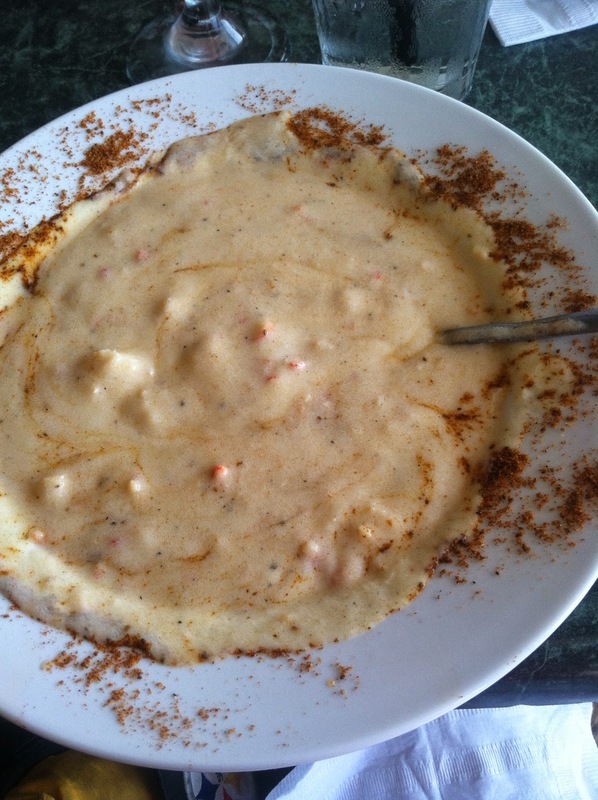 I really love to eat seafood, so I made sure that was part of every lunch or dinner. I also managed a tasty beverage with every lunch or dinner as well. That is part of what vacation is about. As a kid, we spent hours at the beach daily (we went to OC pretty much every year). I don't know if it is just that my skin is older, the ozone layer is depleted, or what, but I ended up burnt and with a rash by the second day. This despite my drowning my skin in sunblock multiple times. Still, nothing can beat the ocean. Once again I have slacked off with posting. I did write about/sing the praises of RiverQuest, an educational boat ride on the North Shore, so please check that out in my previous post below! Anyway, here is what has been going on in my life since last time. This past fall, I had the wonderful experience of being a chaperone on a field trip to RiverQuest, a non-profit educational organization that operates a river learning center for students, teachers, and the community of southwestern Pennsylvania. During the four-hour boat trip, the students got to examine organisms under microscopes, test water, learn various facts about plant and animal life in the river and environment, and much more. Recently, I looked up RiverQuest on the great big internet, and I discovered (or perhaps just remembered) that the organization offers Saturday cruises. So I decided the family should go. 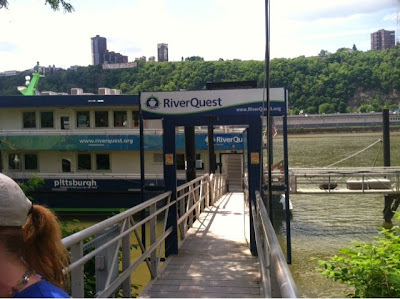 After a long walk around the North Shore on beautiful sunny day, we boarded the RiverQuest boat on the Ohio River, after having purchased our tickets at the nearby Science Center. Have I mentioned how much I love Phipps?! 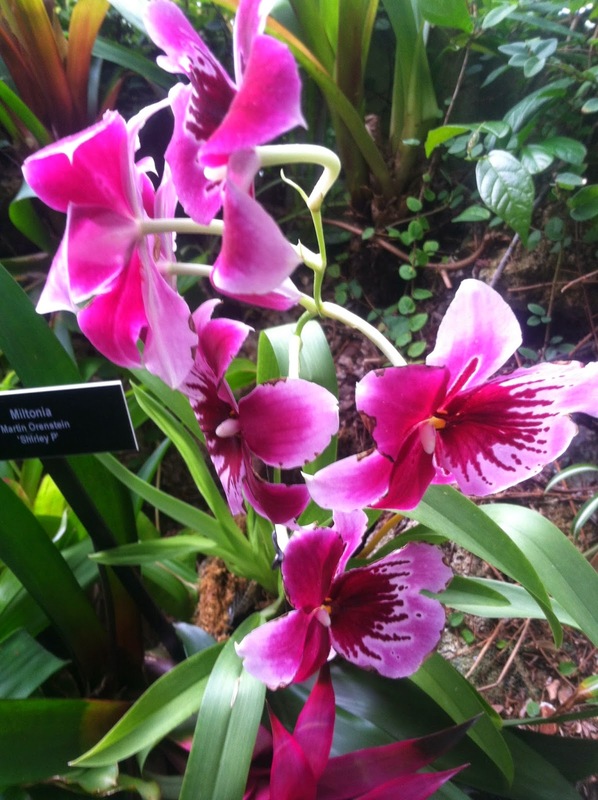 Including that time, I have been to Phipps at least five times, sometimes with others and sometimes alone. I have gone to the winter show, the spring show, to something in between the winter and spring show, and then J and I went today, for the summer flower show. Maybe I will do a post of the spring show, for posterity's sake. But here is the summer show! Here are some pics of the Butterfly Forest. We watched some butterflies come out of their chrysalises, which was really cool.